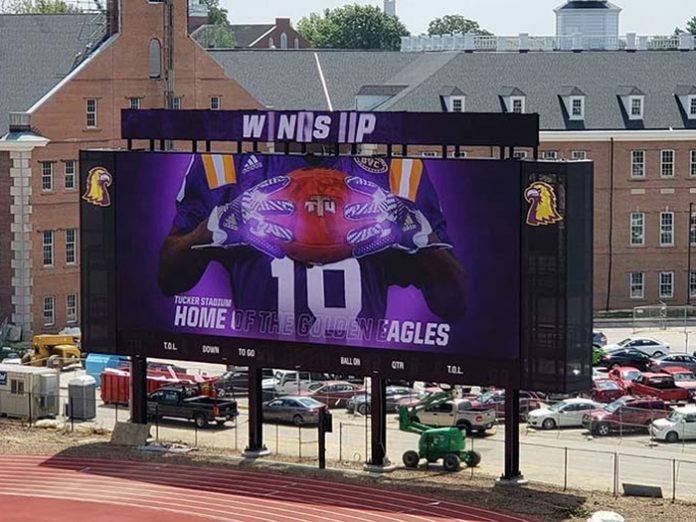 Tucker Stadium, Tennessee Tech University, has new LED displays engineered and installed by Daktronics. The company will implement a new sound system to add to the game-day experience at the stadium. Installations will be revealed when the football team kick off their home schedule Thursday, 8 September. The new end zone display will measure 30 feet high by 80 feet wide and an upper ribbon-style display mounted above the end zone display will measure 5 feet high by 83 feet wide. Both displays will feature 16-millimetre line spacing to bring excellent image clarity and contrast to fans throughout the seating bowl of the stadium. The main display is capable of variable content zoning allowing it to show one large image or to be divided into multiple windows. It can show any combination of live video, instant replays, statistics and game information, graphics and animations, and sponsorship messages. A custom outdoor audio system will be integrated with the video and scoring system at Tucker Stadium. It will provide full-range sound reproduction and deliver clear and intelligible speech for a powerful audio experience. Fixed-digit scoreboards are included in the installation to ensure fans receive all the pertinent game-day statistics they expect throughout the game. Locker room clocks are also being installed to keep players and coaches informed while away from the field.